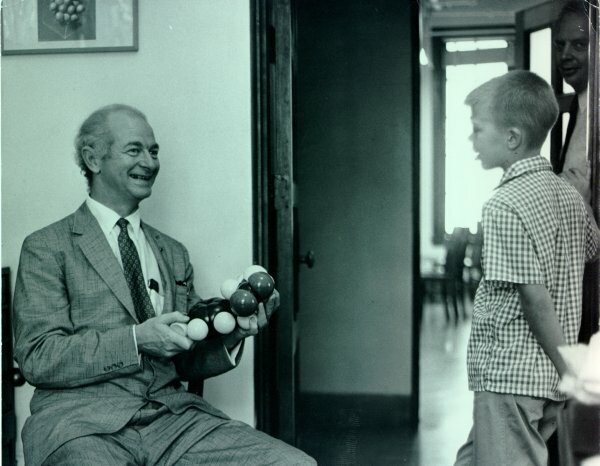 Linus Pauling showing a molecular model to a young boy. 1950s. 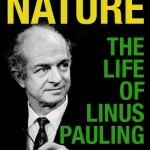 On March 31, 1951, Linus Pauling and numerous associates published seven revolutionary papers in a single issue of the Proceedings of the National Academy of Science. The research had been funded by the Rockefeller Foundation and carried out at the Gates and Crellin Laboratories of Chemistry, at Caltech. The first two articles: “The structure of proteins: Two hydrogen-bonded helical configurations of the polypeptide chain” and “Atomic coordinates and structure factors for two helical configurations of polypeptide chains,” have been discussed by us in the two weeks prior to this one. The remaining five will be described here in much shorter detail, as they are technical in the extreme. 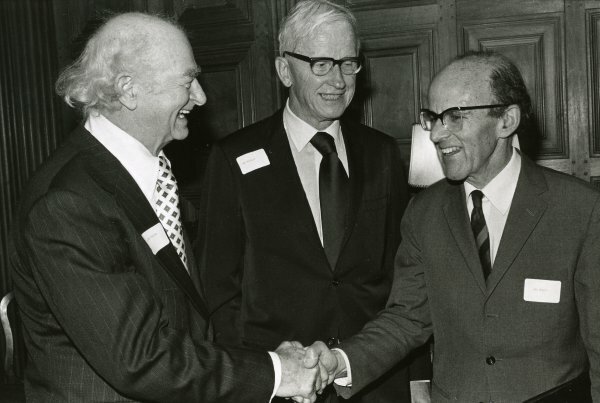 The third article was titled “The structure of synthetic polypeptides,” and was written by Pauling and Robert B. Corey. The article claimed that the gamma helix and alpha-helix protein structures had forms that were also assumed by synthetic polypeptides. The authors discussed how the fibers of synthetic polypeptides had been analyzed using x-ray and infrared spectroscopy, which allowed them to determine the shape of the synthetic structures. Other scientists had also proposed the shapes of such structures, but Pauling and Corey rejected their hypotheses, as the structures the other scientists had proposed would have been “inherently unstable.” They concluded that their structure was the superior idea, and that while other structures potentially existed, they would be extremely difficult to measure due to their size. The fourth article was more crucial to the narrative of protein structure that Pauling and his collaborators were weaving. 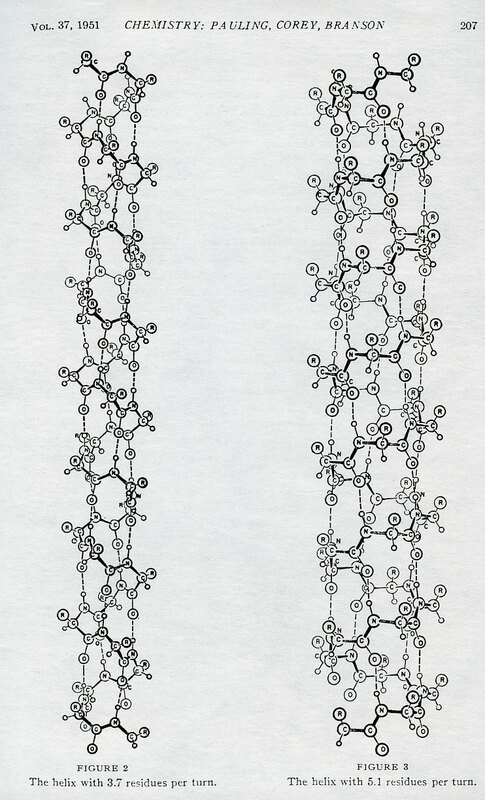 The title was self-explanatory, and somewhat less technical than the others: “The pleated sheet, a new layer configuration of polypeptide chains.” In it, Pauling discussed how it had been long-believed that polypeptide chains are fully stretched and bound to adjacent, lateral chains of protein. He proposed instead a new idea, the so-called “pleated sheet.” In his suggested structure, the chains formed planes and certain bonds were arranged perpendicular to the planes of the chain, instead of coincidental with them. As a result, the chains are staggered and scrunched, instead of stretched in long, parallel lines. 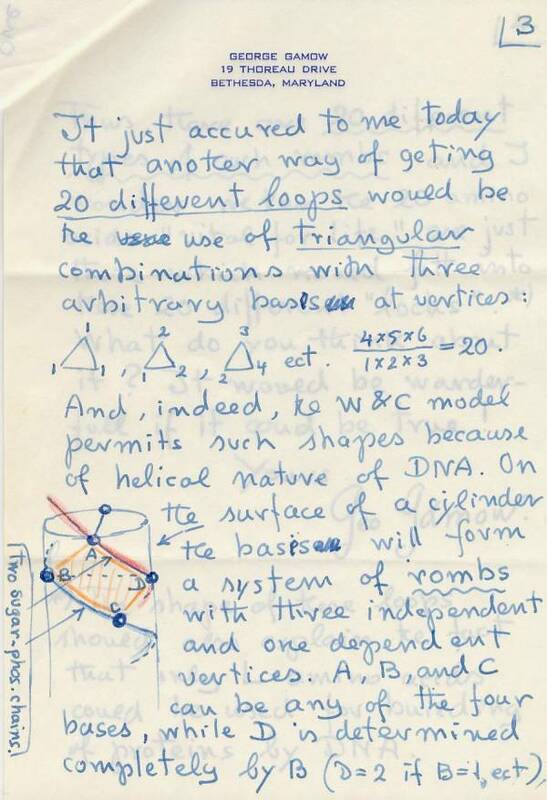 The rest of the article was devoted to the mathematics that Pauling had used to develop and explain the shape. Feathers – specifically the atomic structure of feathers – was the topic of the fifth article, titled “The structure of feather rachis keratin.” The piece was written once again by Pauling and Corey and it analyzed rachis – a term with many meanings, but in this context referring to the central shaft of a feather – and keratins, which are structural proteins. The authors wrote that x-ray analysis of feather rachis keratin had shown the patterns of the polypeptide chains to be extremely complex, and notably shorter than expected. The rest of the article was spent explaining how the concept of the pleated sheet was mathematically relevant to feather rachis keratin. This article differed from the other six in that it had an addition dated April 10, 1951. Written by Verner Schomaker, the addition revealed that subsequent research had shown that, while its basic premise was correct, the argument outlined on the piece’s first two pages was in fact wrong, and that the rest of the article hoped to amend that. 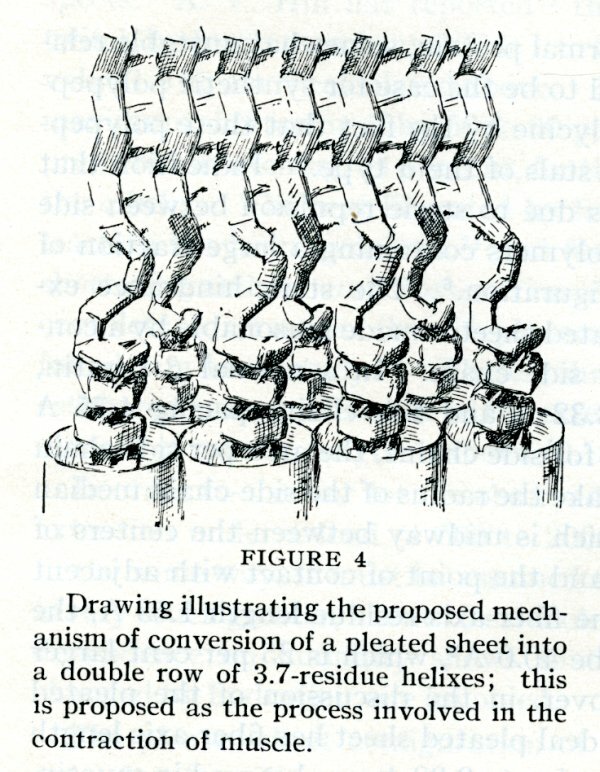 Pauling and Corey argued that relaxed muscle was configured as a sheet, while contracted muscle formed an alpha-helix. The sheet configuration was inherently unstable relative to the alpha-helix, which made it easy for the hydrogen bonds holding the muscle in a sheet to break. This breakage allowed the polypeptide chains to coil and in turn made the muscle contract. The mechanism to prevent a chain reaction that might result in the sheet ripping itself apart during contraction was not understood, though Pauling had some ideas for that as well. The rest of the article was spent analyzing the amounts of energy released in frog muscle contractions to provide hypothetical amounts of energy expenditure and size for contractions in human muscle. 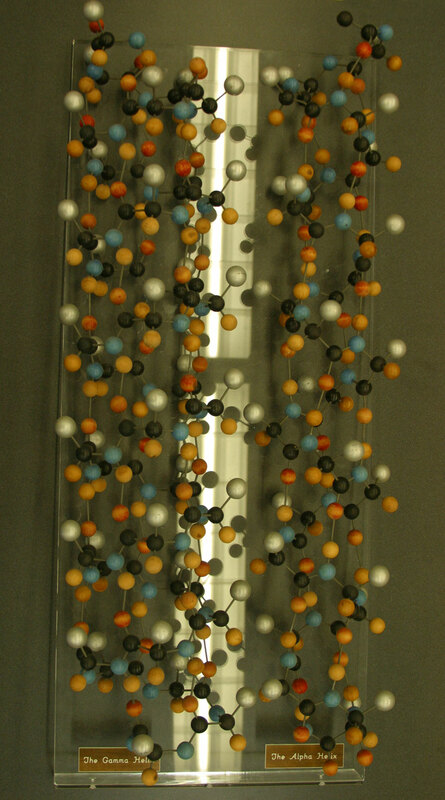 Representation of the collagen-gelatin molecule. April – May 1951. Collagen is a very interesting protein. It has well-defined mechanical properties (great strength, reversible extensibility through only a small range) that make it suited to the special purposes to which it is put in the animal body, as in tendon, bone, tusk, skin, the cornea of the eye, intestinal tissue, and probably rather extensively in reticular structures of cells. Another intriguing feature of collagen-gelatin was that it provided similar x-ray photos regardless of the source. In his article, Pauling noted that twenty-six samples, ranging from demineralized mammoth tusk to sheep gut lining, were all photographed by a scientist named Richard Bear and each resulted in remarkably similar images. Pauling compared them to a photograph of raw kangaroo tendon taken by Corey and Ralph W. G. Wyckoff, which also provided a view of what appeared to be the same structure. Pauling wrapped up the article discussing how three molecular chains wrapped into a distorted coil, and how the correlations between collagen-gelatin proteins and hydrogen could affect the structure. 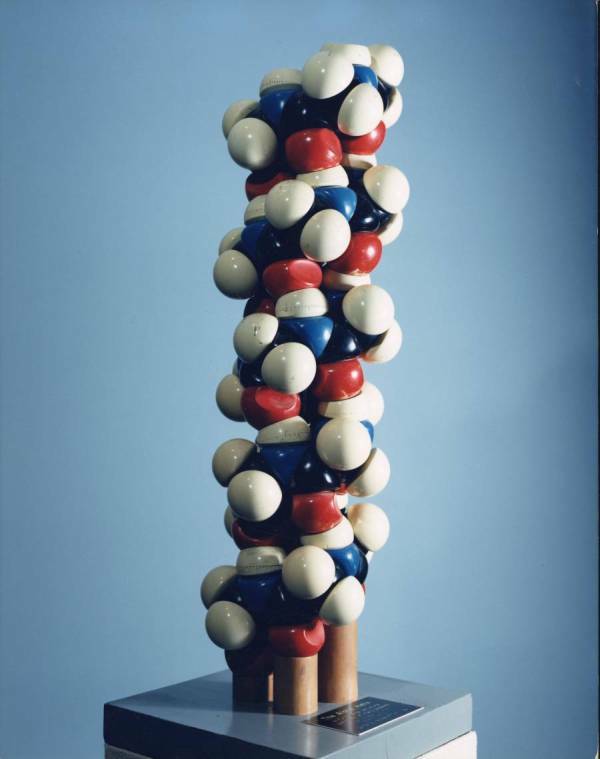 Space-filling model of the alpha helix. It has been said that sometimes blessings come in disguise, and so it may be that we have the damp English spring to thank for the elucidation of the alpha-helix structure of alpha-keratin – a fundamental and ubiquitous secondary structure pattern found in many proteins. 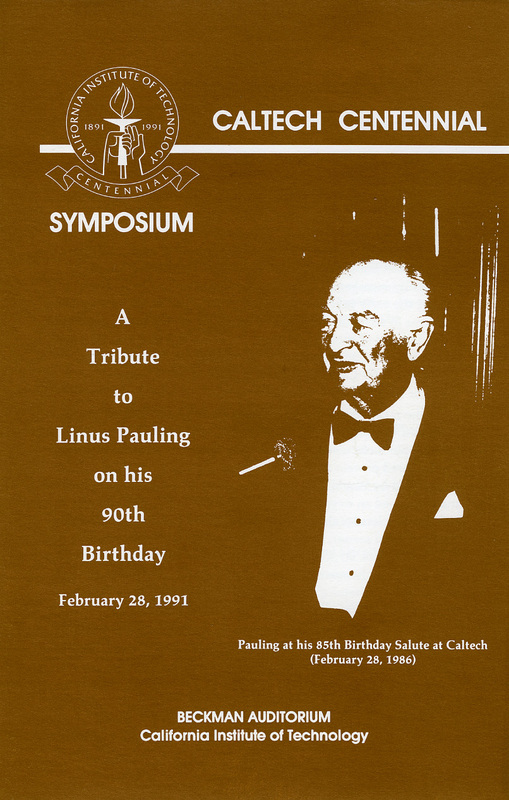 Linus Pauling was plagued by sinusitis for much of his time in England, and for three days in March 1948 it had become severe enough to put him in bed (as he was fond of saying over the years, this was before his vitamin C days). After a day spent devouring mystery novels, Pauling asked Ava Helen if she would bring him some paper and his slide rule, at which point he started trying to figure out how polypeptide chains might fold up into a satisfactory protein structure. Pauling’s canvas was just an ordinary 8 1/2 by 11 inch sheet of paper. His first step was to draw the correct bond angles and distances onto the sheet, as determined from previous x-ray crystallographic work on polypeptides. Next he folded the sheet along parallel lines into a sort of squared-off tube. 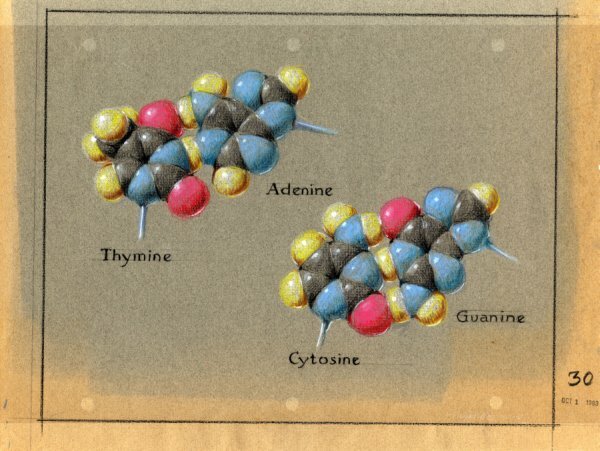 Doing so allowed him to add in representations of hydrogen bonds, which the impromptu model suggested would form between amino acid residues and, as a result, hold the turns of the polypeptide together. Reconstruction of the alpha-helix paper model. Drawn and folded by Linus Pauling, 1982. 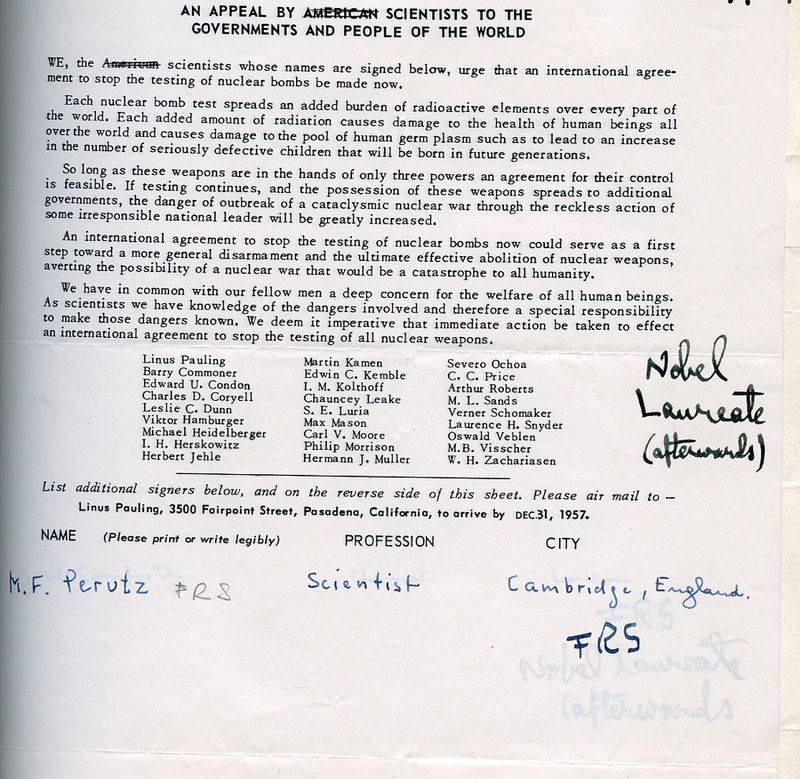 Pauling kept this idea to himself until his return to the United States because something didn’t match up quite right with the current laboratory data. Specifically, the turns of Pauling’s helix didn’t mirror the 5.1 angstrom repeat found in all of William T. Astbury‘s x-ray patterns. 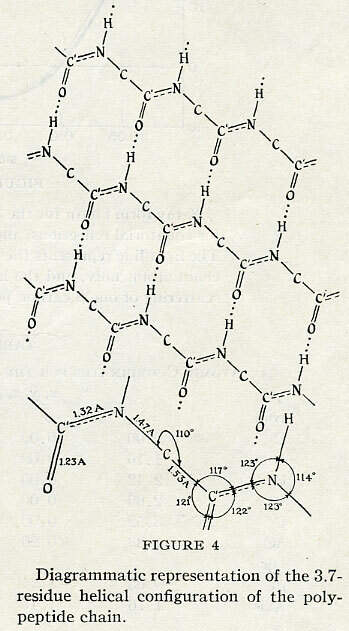 Pauling’s structure came close, but made a turn every 5.4 angstroms, or every 3.7 amino acid residues. 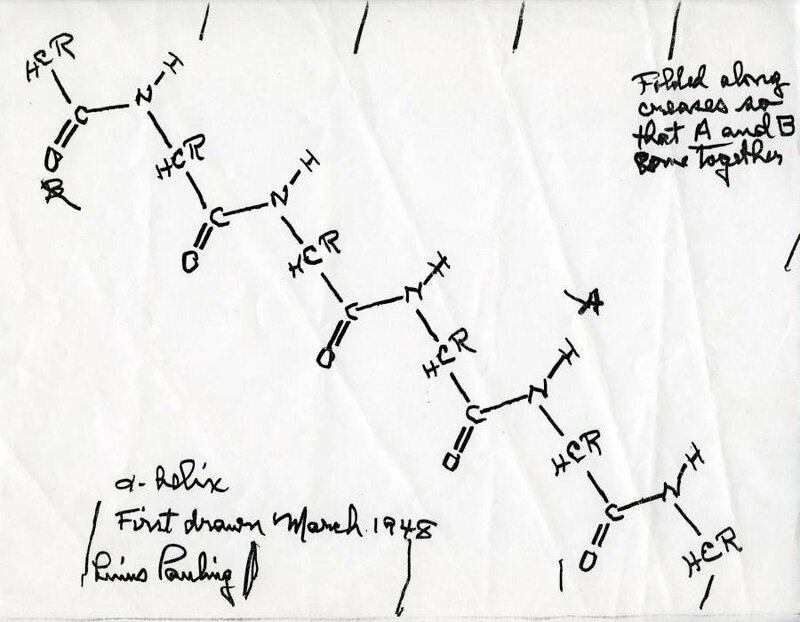 After his return home, with the assistance of colleagues Robert Corey and Herman Branson, Pauling continued refining his alpha helix structure and developing others, including the beta sheet. 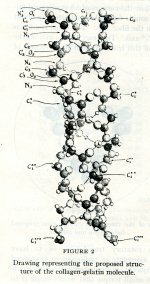 Simultaneously, the Caltech group’s chief British rivals at the Cavendish Laboratory published a paper titled “Polypeptide Chain Configurations in Crystalline Proteins.” The paper promised more than it delivered though, and while it listed many possible structures, Pauling found none of them to be likely. The competition was still on. 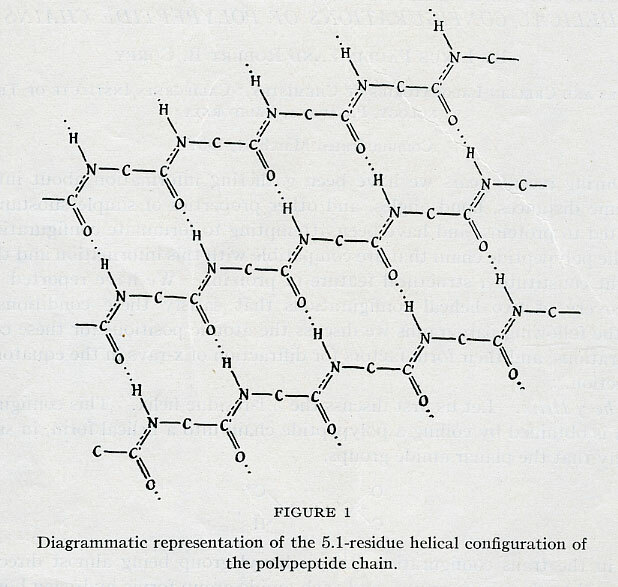 Pauling was finally convinced to publish when he received word that a British chemical firm called Courtaulds had created a synthetic polypeptide chain that showed no sign of Astbury’s 5.1 angstrom reflection in x-ray diffraction images. 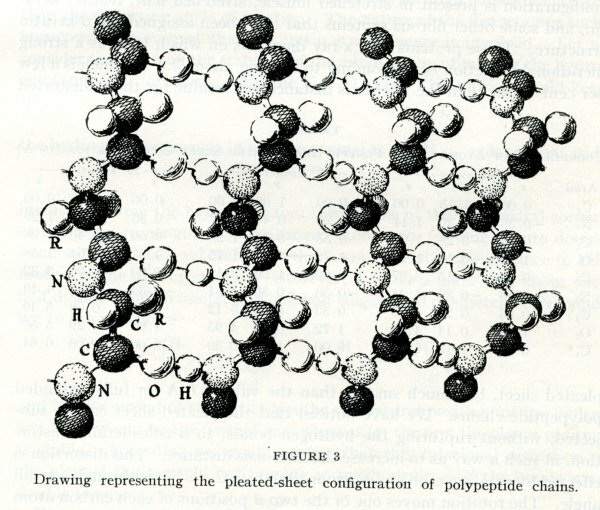 This was enough evidence for Pauling to decide that the 5.1 angstrom repeat was, perhaps, not a vital component of all polypeptide chains. 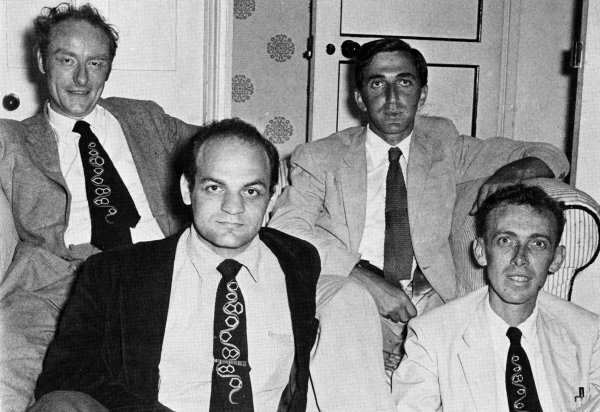 And so it was that in April 1951 Pauling, Corey and Branson published “The structure of proteins: Two hydrogen-bonded helical configurations of the polypeptide chain,” in the Proceedings of the National Academy of Sciences. It wasn’t until a year later that the mystery of Astbury’s 5.1 angstrom reflection was finally solved. 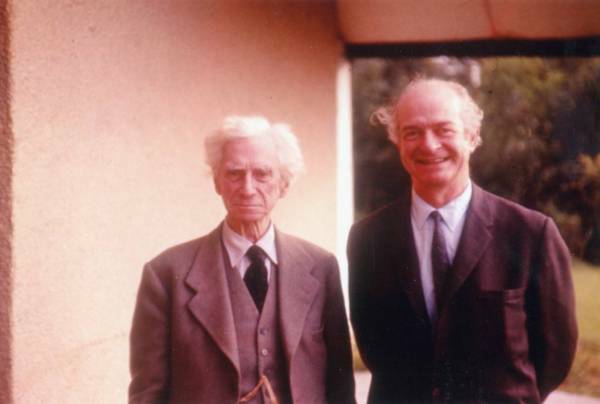 In 1952, on a visit to the Cavendish, Pauling met Francis Crick, the then-graduate student who would go on to play a huge part in the discovery of the structure of DNA. The two maintained similar interests and during a taxi ride around Cambridge found themselves discussing the matter of the alpha helix. 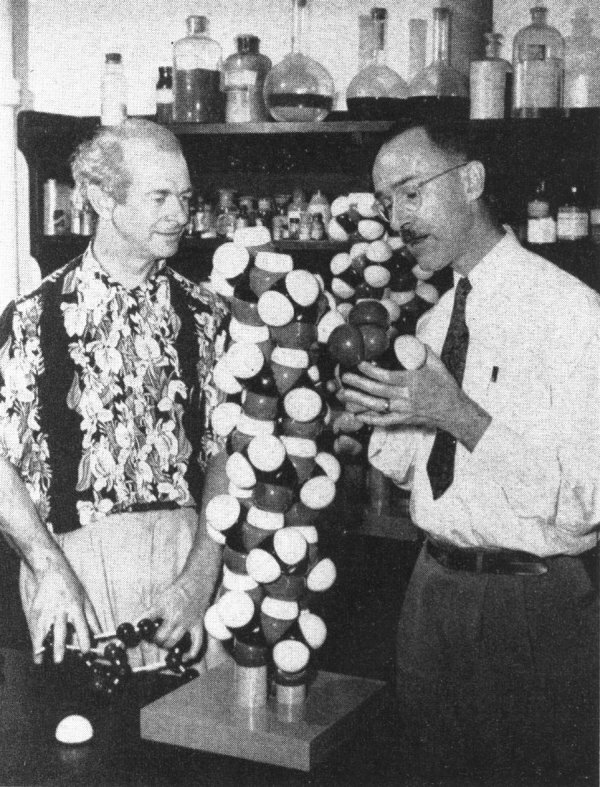 “Have you thought about the possibility,” Crick asked Pauling, “that alpha helixes are coiled around one another?” Whether Pauling had or had not considered this possibility remains a point of contention, but Pauling remembered replying that he had, because he had been considering a number of higher-level schemes for his helixes, including some which wound around each other. 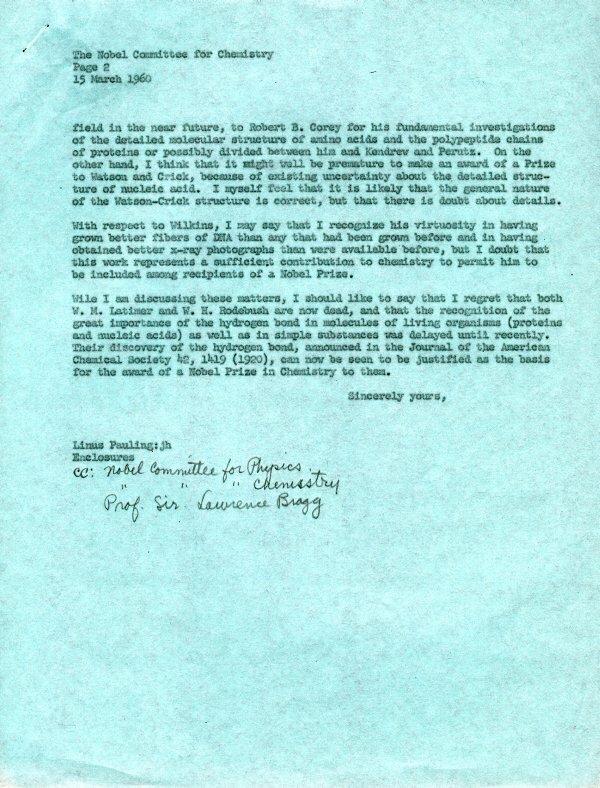 Regardless, Pauling returned to Caltech and both he and Crick set to work on the problem. 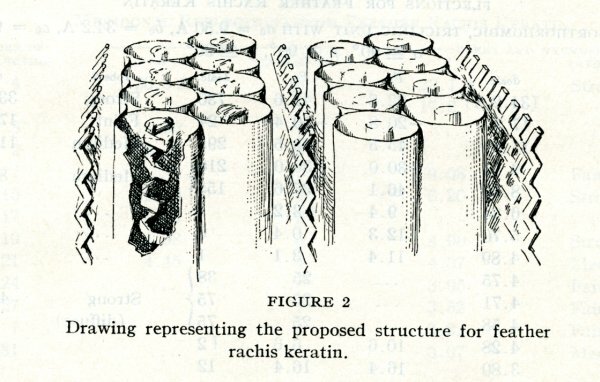 With help from Corey, Pauling discovered a means by which the alpha helixes could wrap around each other in a coiled-coil to produce the problematic 5.1 angstrom found in Astbury’s pictures of natural keratin. Crick, in the meantime, was conducting a very similar study. 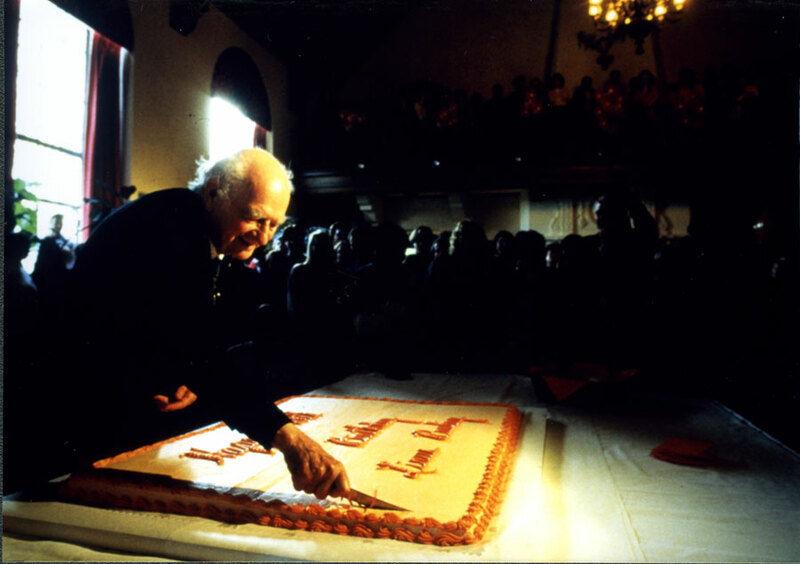 Pauling and Crick, independent of one another, ultimately submitted the solution to this puzzle for publication within days of each other, and at first there was a bit of grumbling as to whom the credit should be awarded. 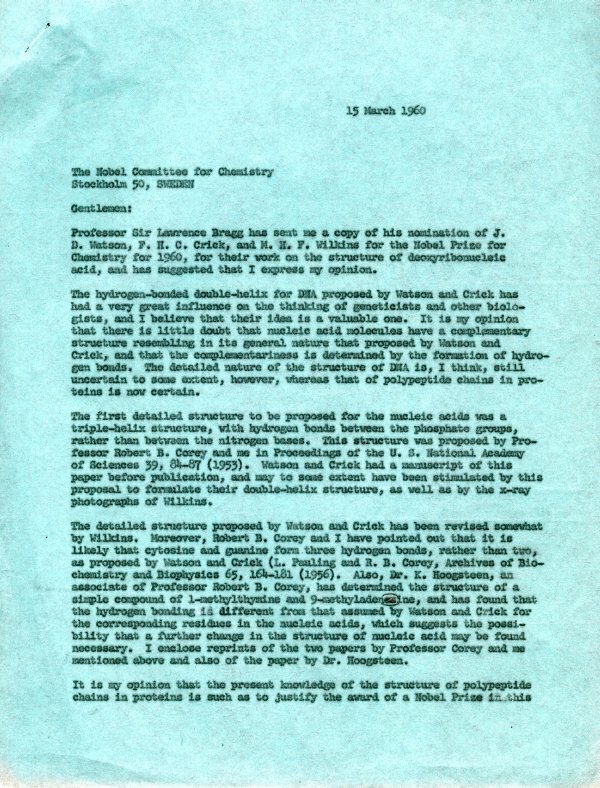 Though Crick’s note was published first, the Cavendish camp eventually conceded that Pauling’s paper included considerably more detail of consequence, and it was finally settled that both scientists had independently come to the same general conclusion. 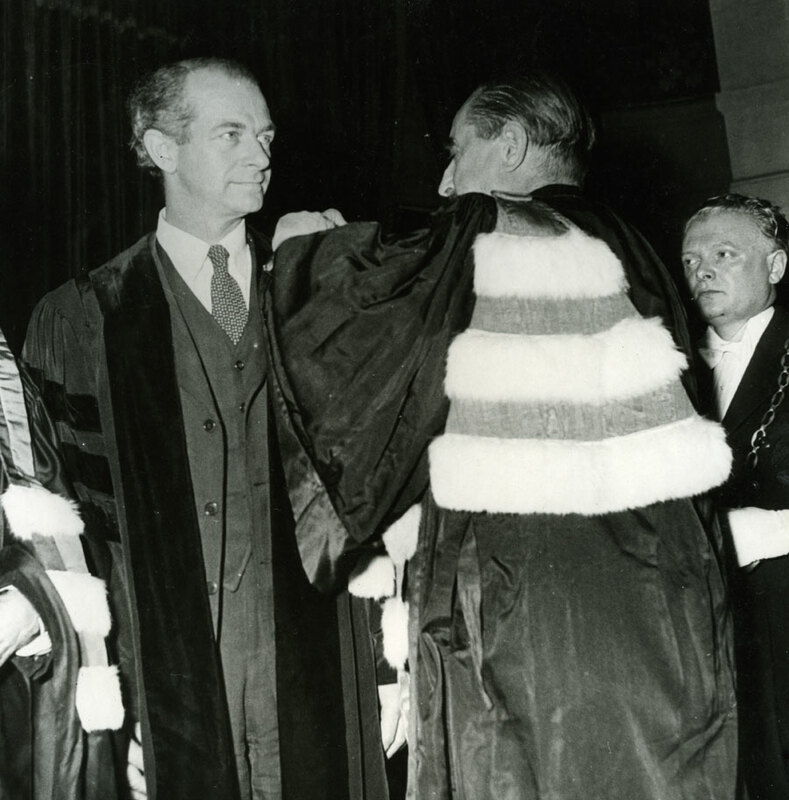 Pauling receiving his honorary degree from the University of Paris, 1948. After Pauling’s two fruitful terms as Eastman Professor at Oxford were up in July, the family split their remaining time between travels in Amsterdam, Switzerland and Paris. Pauling rounded off the trip by receiving yet another honorary degree from the University of Paris, and on August 25, 1948, the Paulings set sail once more on the Queen Mary.